Herman of Tournai (1095–1147), an abbot of St. Martin of Tournai (in Belgium) wrote an account called The restoration of the Monastery of Saint Martin of Tournai. In the prologue, he comments "I even wrote down a certain amount on tablets." He would have been referring to a wax tablet, which were used since the Roman Empire and became increasingly common in the Middle Ages. A shallow wooden or ivory frame filled with soft wax could be written on with a stylus; the other end of the stylus was a flattened blade shape that could be used to smooth out the wax for re-use. The beeswax would be mixed with plant oils and/or carbon to create a more legible surface. Tablets were often not simply one piece; They could be turned into leather-laced "booklets" where the outer tablets held wax on the inside, and inner "pages" would have wax on both sides. Wax tablets were great for business records. A hospital in Enns, Austria used multiple-page wax tablets (that still exist) to track some financial records. Payables due would be printed on parchment and stuck to the left side; money received would be written on the right side in wax and added up. The impression would store indefinitely—so long as you didn't let it get hot. Tablets were also ideal for transactions that did not need to be kept long-term. The impression could last for a week or month or season, and then warmed up and smoothed over for the next set of transactions off the boat. Here's an extensive directory of links to pictures of tablets from across the centuries. mighteth the boones and causeth goode and gladeth and lighteth all men that use it. The leves layde under the heade whanne a man slepes, it doth away evell spirites and suffereth not to dreeme fowle dremes ne to be afeade. But he must be out of deedely synne for it is an holy tree.Strengthens the bones and causes good, and gladdens and lightens all men that use it. The leaves, laid under the head when a man sleeps, do away with evil spirits, and will not allow one to dream foul dreams or be afraid. But he must not be in a state of sin, for it is a holy tree. So was it known in England before the 14th century? The British Library has a manuscript (Royal 12, D xvii) known colloquially as "Bald's Leechbook," a ninth-century medical text written in Old English. Rosemary is mentioned in a number of remedies, for fever, horses leprosy, and toothache (always mixed with multiple other substances). It is highly likely that the Saxons found rosemary growing all over England because of its introduction by the Romans centuries earlier. Robert Grosseteste (c.1175-1235) is considered by some to be the founder of modern English intellectualism. Among other topics, he focused (pun intended) on light. One of his works sought to explain how the sun produced heat. He determined that Method 1 cannot apply here. For heat to transfer from a hot object, there must be a medium through which it travels, and that medium will heat up during the transfer of heat. Clearly everything between the sun and us does not heat up. He decided that Method 2 was also insufficient to explain the heat, because the motion that creates heat is caused by two substances moving in opposite directions—for instance, rubbing your hands together to warm them up—and the sun's circular motion does not act upon a second substance moving in an opposite direction: everything up there moved from east to west. Method 3, he decided, must pertain. He reminds his reader that Euclid explained how a concave mirror can focus the sun's rays to cause a fire. He stated that the sun's rays falling upon the earth are scattered, but reflection by a mirror or refraction by a (clear) spherical body can change the direction of the rays, focusing them via the medium of the dense air and generating heat. For him, this had much to do with the denseness of the medium: he stated that the same amount of light falls on a mountaintop and scattering can be observed there, but the thinness of the medium of air disallows the generation of heat. The St. Scholastica Day Riot was one of the most famous altercations in the history of Oxford, England. Appealing to the Crown did not help the town. The king held the university in high esteem, apparently, and supported its right to its own governance. The town was not allowed to prosecute students or staff of the university. For the town's part in the conflict, its penance was for the mayor and council members to march bare-headed through the streets annually on February 10th. Moreover, each year the town was to pay a fine of 1 penny for each scholar killed. The fine of 5 shillings and threepence was paid annually until 1825. 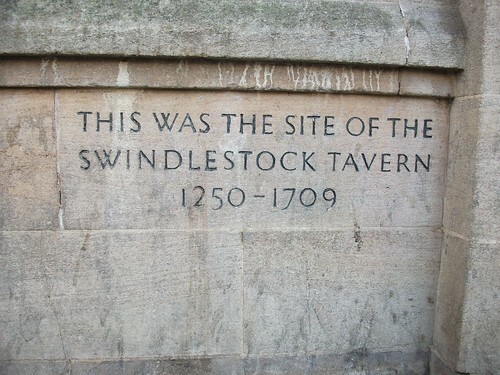 The Swindlestock Tavern itself had not existed for over a hundred years by that time. On the 600th anniversary of the Riot, a ceremony was held in which the mayor was given an honorary degree and the Vice-Chancellor of Oxford was made an Honorary Freeman of Oxford, putting (they hoped) the Town vs. Gown rivalry to rest once and for all. The Abbey of Santa Maria la Real de Las Huelgas was founded in 1187 by Alfonso VIII of Castile, at the request of his wife, Eleanor of England, the daughter if Henry II an Eleanor of Aquitaine. It was founded on land that was going unused at the time; huelgas meant land that is fallow, although nowadays it is used to refer to "labor strikes." Its origin granted it many royal privileges: it was exempt from taxes, held many valuable items that belonged to royal families, and became a traditional site for many royal weddings, such as that between Edward I of England and Eleanor of Castile. The monastery became Cistercian in 1199 and the burial sit for the royal family. Two of the first royal burials were the founders, Alfonso VIII and Eleanor of England. Known for the privileges of its abbess, and for the hospital founded by Alfonso VIII, Las Huelgas gave to the modern world one more fascinating item left over from the Middle Ages: music. 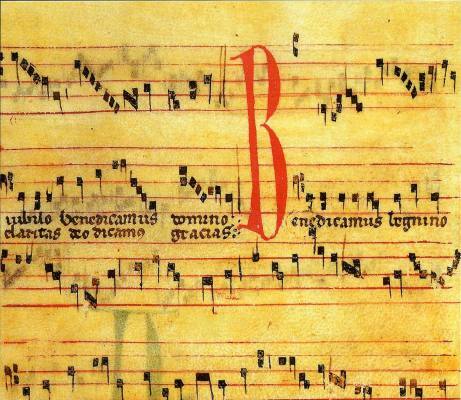 In 1904, while doing research on the origins and development of Gregorian chant, two Benedictine monks found a manuscript in Las Huelgas containing 45 monophonic pieces and 141 polyphonic pieces. They are written on fairly durable parchment in red and black ink with Franconian notation (briefly discussed here and here). The Las Huelgas Codex includes many pieces familiar to scholars, but also pieces that are not recorded elsewhere. Most of the pieces are from the late 13th century, when it is known that Las Huelgas had a 100-woman choir. 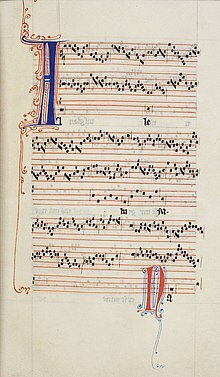 We have to assume that, despite the Cistercian rules against the performance of polyphonic music, the choir of Las Huelgas performed these pieces at will, thanks to their royal patronage and privileges (the abbess was allowed for a long time to call synods, confirm abbesses of other monasteries, and even hear confession and grant absolution!). Here is a recording of the Benedicta et venerabilis II and the Benedicamus dominu, with pictures from the Abbey's architecture and art. Enjoy! Christmas Day was not celebrated in the past with all the pomp and circumstance we grant it today. It was, however, an auspicious day. Coming four days after the winter solstice, it is the day when it is easy to confirm (without careful measurement by instruments) that the days are, indeed, growing longer and therefore the "sun is returning." This made it an important day for many pre-literate cultures, and this importance was not forgotten. The 25th of December was an easy day to remember, and some rulers after Charlemagne used it as the official start to their reigns. In 1066, William the Conqueror of Normandy was crowned King of England in Westminster Abbey in London, having waited well over a month since defeating his enemies and establishing his rule. 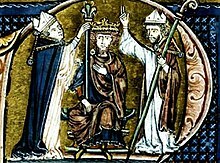 Baldwin of Boulogne (c.1058-1118), one of the leaders of the First Crusade, was chosen to rule Jerusalem after the death of his brother, Godfrey of Bouillon. Godfrey refused the title "King," believing it was inappropriate for anyone other than Jesus Christ to be styled "king" of Jerusalem. Godfrey died in July 1100. Baldwin had no trouble either calling himself "King of Jerusalem" or driving the lesson home by being crowned in Jerusalem on the day celebrating Christ's birth. Roger II of Sicily (1095-1154) started life as Count of Sicily, later becoming Duke of Apulia and Calabria. He worked to unite all the Norman-conquered lands of Sicily and southern Italy. By 1130 he was ruling over a wide area including Apulia, Calabria, Capua, Naples, and part of Spoleto. "Count" and "Duke" were no longer sufficient for his stature, and he had himself crowned the first King of Sicily on Christmas Day in 1130. Christmas Day is a day we associate with gifts. For some people in history, Christmas "gifts" were on a much grander scale. 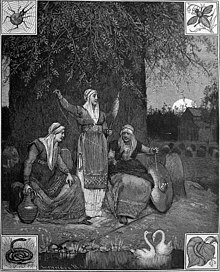 Were the Norse Norns/Fates the "Mothers"? Among the notable works of the Venerable Bede (c.673-735) is De temporum ratione (The Reckoning of Time). It explains why the length of days and nights changes (Bede knew the Earth was a globe); it explains how the Sun and Moon cause the phases of the Moon, and it addresses the relationship between the Moon and the tides (but doesn't understand how the relationship works). It also includes an explanation of various calendars used by different cultures. The whole point of his scholarship was to explain how to calculate the date of Easter, that "floating Holy Day" that can be held anywhere from 22 March to 25 April. The 25th of December was notable in the past because it came four days after the Winter Solstice, the shortest day of the year. By the 25th, it was possible to determine even without precise measurements and instruments that the days were growing longer. The 25th therefore became a day of celebrating the returning Sun. Who were the "Mothers" meant by Bede? We think he was referring to female spirits that had to do with mankind's welfare, and who would be sacrificed to and invoked for bounty for the coming year. Some scholars have linked them to the dísir (singular dís), female spirits that watch over the fate of Norse clans. These would be similar to the Norns of Norse mythology who function like the Fates of Greek mythology. Bede seems to be reliable on many of the observations he makes of other cultures. Unfortunately, he did not elaborate on the "ceremonies" that he "suspected" were performed on Mōdraniht, and we have no other contemporary source for information on what the celebration entailed. Let us look at a classic "political marriage." Eleanor of Aquitaine, wife of Henry II of England and mother of Richard called Lionheart, wanted the best possible match for her son. He was originally betrothed to Princess Alys, the sister of King Philip II of France, but she saw other opportunities for him. In 1190, while Richard was on the Third Crusade, Eleanor met with King Sancho VI of Navarre, who hosted a banquet for her in Pamplona. It is likely that Eleanor negotiated the marriage of her son to Berengaria, the daughter of Sancho and his Queen, Sancha of Castile. 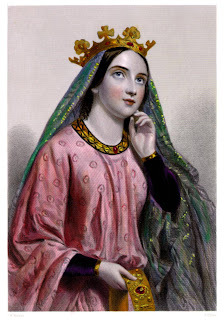 Berengaria had been given the fief of Monreal in 1185; that, and an alliance between Richard and Navarre, would give protection to the southern border of the Aquitaine, the province in southern France that Eleanor had given to Richard. Berengaria had other fine qualities: commentators of the time say she was both attractive and intelligent. Eleanor decided there was no time to waste, and she (now in her 60s!) and Berengaria undertook the long journey to meet with Richard. They caught up with him in Messina on the Island of Sicily. This was possibly the first time Richard and Beregaria ever met, although some believe there was an earlier occasion when they saw each other. Richard ended his betrothal to Alys that year (after all, there were rumors that his father was having an affair with her). Unfortunately, it was Lent during their time in Sicily, so a marriage ceremony was not appropriate. Richard embarked on the next leg of the Third Crusade, and Berengaria took ship with Richard's sister, Joan of England, the widowed Queen of Sicily. * The ladies' ship foundered off the coast of Cyprus, where Isaac Comnenus opportunistically took them prisoner. When Richard learned of this, he brought part of his army to Cyprus, defeated and captured Comnenus, and took control of Cyprus. Berengaria and Richard were married on 12 May 1191, then left Cyprus for Palestine. Once arriving in the Holy Land, Berengaria left for Poitou. It is likely that she never saw her husband again. When Richard was going home in 1194, he was captured in Germany. Berengaria and Eleanor separately raised ransom money. Richard spent little time in England as king, and Berengaria never went there, preferring her own southern lands. She did not attend his funeral at Fontevrault. After Richard's death, his brother John refused to pay Berengaria's pension, despite intervention by Eleanor and Pope Innocent III. John's son, Henry III, finally paid the debt of £4000. She used some of the money to found a Cistercian monastery, the Pietas Dei at L’Épau. When she died, on 23 December 1230, she was buried there, rather than at Fontevrault next to her husband. *Richard's diversion to Sicily was to free his sister from imprisonment by the usurper, Tancredi. Sicily, an island of less than 10,000 square miles just off the coast of Italy, would not seem to merit its own king, and for a long time it didn't have one. But just as England was brought to heel under a Norman ruler, so too did Normans take over Sicily and eventually expand its power. Before William of Normandy conquered England, Normans were also traveling in other directions. Norman mercenaries went through southern Italy in the late 10th century, looking for employment. Originally they fought on behalf of the city-states in the region, but by the 11th century they were actually ruling the regions of Naples, Capua, Apulia, Clabria, and had carved up Sicily into several smaller counties and dukedoms. Roger Hauteville and his brother Robert Guiscard came to southern Italy and discovered the Byzantine Greek Christians living under Muslim rule by Moors from Tunisia. In 1061 the two brothers and an army took Messina, then captured Palermo in 1071. Over the next few years they expelled the Moors, and Roger became Count of Sicily. Roger had three wives and several children. One of his last children was also named Roger. Roger II (22 December 1095-1154) became Count of Sicily in 1105, inheriting the title (and parts of Sicily) when his elder brother died. At the age of 16, he was named Count of Sicily and Calabria. In 1122, Roger's cousin, Duke William of Apulia, accepted Roger's help in dealing with an enemy; in exchange, he offered to renounce his claims to certain lands. When William died in 1127, Roger claimed all lands that had been distributed to members of the Hauteville family on Sicily and in the Italian peninsula: Calabria and Apulia, as well as Capua. Pope Honorius II was wary of the growing power of Normans in southern Italy and Sicily, but his attempts to counter Roger with force or politics failed. By 1129, Roger's rule of Apulia was accepted by his neighbors. When Honorius died in 1130, Roger threw his support behind Anacletus II against Innocent II. 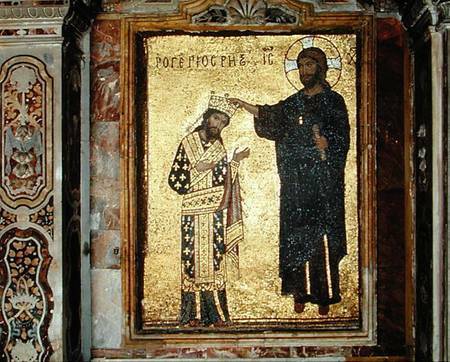 Anacletus prevailed and, despite being later declared an antipope, he was able to reward his supporter with a papal bull declaring Roger King of Sicily. Roger was undisputed ruler of the island and much of southern Italy, a worthy kingdom indeed. Roger continued to expand his territory. When Roger's sister, Matilda, who had married Ranulf II of Alife, came to Roger claiming to have been abused by her husband, Roger took Ranulf's lands as well as his brother's county. Pope Anacletus died in 1138, and Pope Innocent II sent an army to teach Roger a lesson: the pope mistrusted the power of the expansive Kingdom of Sicily, and wanted a buffer state between Sicily and his own territory. Innocent thought Capua would make a good neutral space between the two. His army failed, however. Given all the fuss about the Mayan calendar, I thought it would be fun to look at other times when people thought the world might end. The Epistles of Paul (1st century CE) in the New Testament suggest that Jesus' return was imminent and would start the process of the end times. Saint Clement (c.90 CE) predicted the end of the world was imminent (probably influenced by Paul). Bishop Hilary of Poitiers (c.300-c.368) was called the "Hammer of the Arians" for his opposition to them. He claimed in 365 that Emperor Constantius II (a semi-Arian) was the Antichrist, and the Apocalypse was imminent. Hilary's student, St. Martin of Tours (316-397), claimed the end would come by 400 CE. Hippolytus (170-35), sometimes called the first antipope, was a great scholar who thought 500 CE was a good round number for the end of the world. The historian Sextus Julius Africanus (c.160-c.240) also thought 500 was a good round number for the end times. In 968 CE, the army of German Emperor Otto III saw an eclipse and widely believed that the end was nigh. In 992 CE, Good Friday (a "floating" holy day) coincided with the Feast of the Annunciation. This concurrence had been thought to be a sign of the end. A report came from Germany that the sun rose in the north, and that suns and moons were fighting in the sky. Other countries missed that sight. In May of 1000 CE, Charlemagne's body was disinterred in order to fulfill a legend that an emperor would rise from his sleep to fight the Antichrist. A belief that Jesus would return 1000 years after his death made people look to 1033 CE as a date for the beginning of the end. Pope Innocent III, scholar that he was, added the legendary number 666 to the date of the founding of Islam, and concluded that the end would come in 1284 CE. The Black Death was seen by many as the end. While other history sites were celebrating the anniversary of the coronation of King Henry II yesterday, I was thinking about the anniversary of the death of Pope Urban V (1310-1370). Born William de Grimoard to an aristocratic family, he became a Benedictine monk and later made the abbot at the Abbey of St. Victor, where he made a tribute to John Cassian. He was sent to several universities to exercise his clever mind, and became an expert in Canon Law, the laws of the Church. He taught Canon Law at Avignon, Montpelier, and Paris. Returning to Avignon from a trip to Naples, where he had been sent by Pope Innocent IV, he found the pope dead. In the conclave that followed, no clear winner could be found, and Abbot William found himself being put forward as a compromise candidate. At this point, election of a pope had been formalized to the point where the candidate needed to be a cardinal, and William wasn't even a bishop. A hasty ordination was arranged. Not a fan of ostentation, he continued to wear his Benedictine habit. A fan of education, he restored a school of medicine in Montpelier. His personal physician was the most-renowned surgeon of the day. He tried to restore the papacy to Rome from Avignon. He tried to get England to pay several years' worth of payments due the papacy, and clashed with Wycliffe over it. He attempted a Crusade against the Turks, which never got off the ground. He also took a strong stand against heretics. In 1363, he proclaimed the papal bull In caena Domini (At the table of the Lord), a collection of pronunciations of popes that merited excommunication for transgressors, and for which only the pope could give absolution. This bull, amended to include later papal injunctions, was repeated annually on Holy Thursday or Easter Monday. It listed infringements against papal authority as well as heresies, sacrileges, and other crimes. It was used to justify many an inquisition. Over the centuries, rulers of Europe—both Catholic and Protestant—considered In caena Domini to be an infringement on their rights as sovereigns and complained. The annual recital of it was finally ended in 1770 by Pope Clement XIV. What do a Jewish philosopher, a Greek fabulist, and a Latin poet have in common? The following story and its moral. 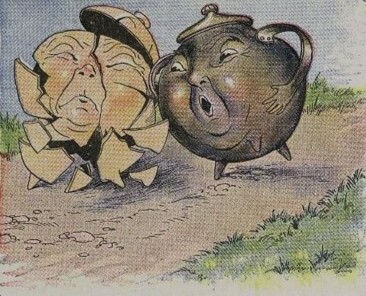 So the Earthen Pot at last consented, and the two set out side by side, jolting along on three stubby legs first to this side, then to that, and bumping into each other at every step. The Earthen Pot could not survive that sort of companionship very long. They had not gone ten paces before the Earthen Pot cracked, and at the next jolt he flew into a thousand pieces. The same story crops up again in the early Middle Ages in the fables of Avianus (5th century CE). In Avianus' version, two pots are floating downstream. * The metal pot suggests that they stick together, but the clay pot wants him to keep his distance, explaining "Whether the wave crashes me into you or you into me, in either case I will be the only victim." The moral is that one should deal with equals; socializing (or going into business) with those above your station was risky. In cultures where society was sharply divided into different classes, this was advice worth repeating. *Apparently, Avianus was fine with pots having a conversation, but walking on legs was too unrealistic for him! We don't talk enough about Anglo-Saxon, but the Yule season and Christmas traditions evoke Old English images and customs (at least, in the Western Hemisphere) rather than Latin/Roman culture. So let's talk about wassail. If you are interested, there are countless recipes online for wassail. For a modern take on old recipes, Alton Brown is always reliable. A recipe that sticks more to its roots can be found at Nourished Kitchen. For an inauthentic recipe that attempts to make wassail easy for the modern cook, you could do worse than Gode Cookery. Yesterday's post on cheese included an anecdote about Charlemagne, attributed to Notker the Stammerer. One would think that "Notker" was an unusual name in any day and age, but it turns out to have been very popular—especially at the Abbey of St. Gall. Ekkehard IV (c.980-1056), a monk of St. Gall, continued a chronicle that had been begun by others. Through the Casus sancti Galli (Doings of Saint Gall), we learn about the history of its inhabitants. Notker the Stammerer (c.840-912) was called "delicate of body but not of mind, stuttering of tongue but not of intellect, pushing boldly forward in things Divine, a vessel of the Holy Spirit without equal in his time" by Ekkehard. He was a prolific writer, but the work he is most known for is a collection of anecdotes about Charlemagne that has been called a "mass of legend, saga, invention and reckless blundering." Supposedly, Notker wrote De Carolo Magno (Concerning Charles the Great) in honor of a visit to St. Gall by Charlemagne's great-grandson, Charles the Fat. 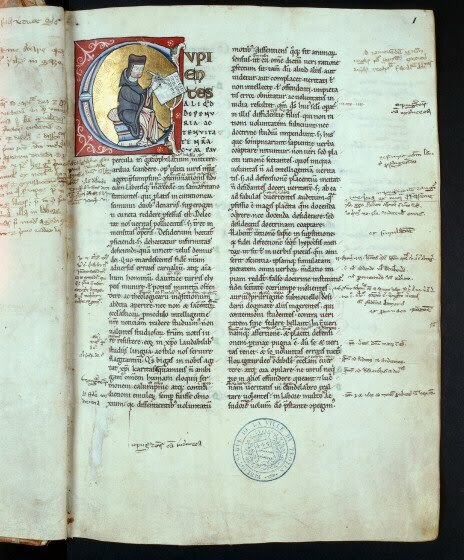 * It is riddled with errors, such as when it claims that the Venerable Bede (672-735) devoted a book of his Ecclesiastical History to King Pepin the Short (714-768), who did not become a king until 752; when Bede died, Pepin's grandfather, Charles Martel, was king. Notker Labeo ("the Thick-Lipped") was a nephew of the Ekkehard clan. He lived from c.950-1022 and had a reputation in the monastery as a voracious reader. He took up translating various philosophical texts into German, for which he was later called Notker Teutonicus ("the German"). When he died, he asked that he be buried in the same clothing he had always worn, to hide the fact that he wore a heavy chain around himself to mortify the flesh. Notker Physicus, who died in 975, was called thus (according to the Catholic Encyclopedia) because of his very strict discipline. His knowledge of medicine is praised by Ekkehard, and he is probably the same Notker who was called Notarius (notable) who was known at the court of Emperor Otto I for his skill in medicine. There was a Notker who was a nephew of Notker Physicus, of whom we know little except that he became Abbot of St. Gall in 971 and died 15 December 975. He was considered exceptionally pious. Yet another Notker (c.940-1008) was the provost of St. Gall and became the Bishop of Liège. He established schools that became famous and drew numerous students. He is responsible for architectural projects, such as St. John's in Liège, designed after the Aachen Cathedral. *Charles was the son of Louis the German, the son of Louis the Pious. Cheese-making; molds can be seen on the left. Warm up some milk, add an acidifying agent, let it cool, drain off the whey to leave the curds, and the result is cheese. We don't know who first made cheese—the best guess is that milk stored in a vessel made from the stomach of a ruminant became cheese accidentally—but it has been around for thousands of years. The Romans loved cheese—especially fresh goat cheese—and Pliny has much to say about the different kinds from different parts of the Empire. As cheese-making spread—often by the expansion of Roman culture into Europe—local varieties developed due to differences in climate and bacteria. We cannot say which variety of cheese tickled Charlemagne's palate. Gorgonzola is mentioned in 879, and cheddar around 1500, but we don't know if 9th century Gorgonzola or 16th century Cheddar tasted the same as the varieties we eat today. 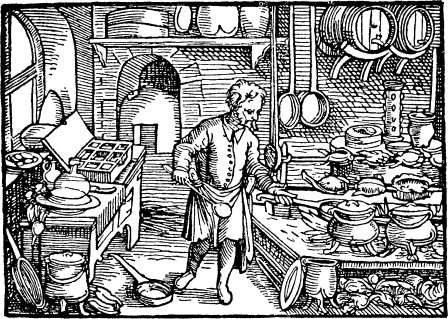 Medieval Cookery has a recipe for fresh cheese, and you can find more at the Medieval Cheese Forum. While re-examining Aristotle, Jean Buridan used observation and brainpower to anticipate some of the ideas we attribute to Galileo and Newton. He carried his ideas further when he put his mind to the question of the Earth's movement. For most scholars of the Classical and early Medieval eras, the Earth was fixed, and the Heavens rotated around the Earth once each day. Buridan didn't like this: the Heavens are so much larger than the Earth; why would God design such an inelegant system? Moving the Earth would be easier. Ptolemy knew this could not be, because if the Earth were rotating, there would be a constant rushing of wind as the air of the atmosphere passed over the land underneath it. Buridan scoffed at this: the atmosphere would be rotating just as the land does. There was no reason to dismiss the idea that Earth rotated daily. For Buridan, however, empirical evidence was crucial. Of course, his predecessors argued, the Earth clearly does not move; we can see that. Buridan, however, likened the situation to being in a boat on a river. An observer on a second boat that was tied to the bank would see the first boat moving, but if the observer on the second boat could not see the surrounding landscape, then he would not know which of the boats were moving. The problem, Buridan knew, was that without an outside frame of reference, one cannot tell if it is the Earth or the Heavens that is moving. He needed an experiment, and he thought of one. ...and that's when he made his mistake. Here was his idea: shoot an arrow straight up above your head. If it comes back down where you are standing, then the Earth is stationary. If the Earth rotated under it, then the arrow would come down somewhere off to the side. He didn't realize that the same property that moves the atmosphere along with the ground would carry the arrow along as well. 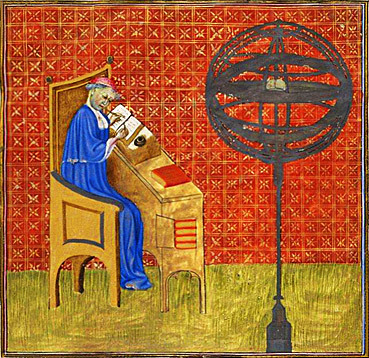 It would be Buridan's most brilliant student, Nicholas Oresme (c.1325-1382), who would realize and state that the arrow moves along with the Earth and atmosphere. Lacking a way to definitively prove his ideas, however, Oresme would ultimately fall back on the Bible for guidance on this issue. Averroes (1126-1198) undertook to explain and comment on the works of Aristotle, in an attempt to clarify the Greek philosopher's concepts. One of those concepts was the idea of man's intellect, the debate over which was both stimulating and shocking for the medieval world. Aristotle distinguished between a passive intellect, which is man's predisposition to accept and hold ideas, and an active intellect, which was the agent of analysis and creativity. * The active intellect was an outside force, and the blending or convergence of the external active intellect with the internal passive intellect differed in individuals, which is why we could strive to learn and think and better ourselves intellectually, but we were still different from each other. The connection between active and passive was not the same in each person. This accounted for different and individual personalities. This was an obvious parallel to Aristotle's Realism: the idea that there exist "universal" abstract concepts—such as "dog"—outside of our direct experience, that allow us to directly experience multiple different dogs with different characteristics (which he called "particulars") and yet understand that they were all dogs. Averroes explained this further, and created a religious controversy. If the active intellect was external (and from a divine source) but the less-powerful passive intellect resided in man, and it was the blending of the two that created personality and human intelligence, then what happens at death when the external active intellect is removed? As a divine and lasting and (presumably) unchanging force, it stays as it is, unaffected by its temporary connection to an individual. The human-centered passive intellect dies with the human, the active intellect withdraws, and therefore there is no individual personality that exists anymore. For Averroes, understanding Aristotle meant that there was no survival after death of a personality. Your personality—what makes you "you"—is gone when you die, and there is no room here for a soul with your personality to exist in an afterlife. Orthodox Mohammedan theology did not agree with this, nor did Christian theologians such as St. Bonaventure and St. Thomas Aquinas. Averroes defense against the charge of heresy? That reason forced him to express these thoughts, but that of course he adhered to the truth as explained by his faith. *Aristotle used the term "intelligences" to refer to the non-physical (divine, or spiritual) forces that moved the celestial spheres. Christian thinkers would later call these "angels." At the foundation of philosophy is a question: what defines reality? There are several questions that are connected to this. Let us start with: when we say that a lot of different animals are all dogs, to what quality are we referring that makes the Dachsund and the Great Dane both dogs? Is there an essential quality of "dog-ness"? Some universal concept that is inclusive of all dogs, despite the particular differences between breeds? There it is: universals and particulars. Realism says that both universals and particulars exist. That is, we recognize that different dogs/houses/trees are those things because, although they have different particulars, there is a universal essence of dogs/houses/trees that exists. Plato and Aristotle were Realists. Nominalism says that the world is made only of particulars. Things we see are put into categories by our thought processes and our language, not by the existence of some abstract universal. William of Ockham and Jean Buridan were Nominalists. In the two diagrams shown, we see that in Realism, although John and David have different Particulars, they are defined by their Universal quality as human beings. Nominalism, however, shows John and David only defined by their Particulars. The category of Humanity is created by us. There is no abstract "Humanity" essence that exists independent of John and David. Getting at the truth produced some fascinating thought experiments. One—The Puzzle of Theseus' Ship—was posed by Plutarch (46-120 CE). The ship of Theseus was preserved in Athens for several generations. As pieces of it decayed, they were replaced with new wood, so that the ship would stay intact. If a thing is based on its particulars, then with the particulars of this ship having changed over the years, is it still Theseus' ship? If there is some universal of Theseus' ship (as Realism says) then it is still his ship. If there are only particulars (as Nominalism says) then it isn't. British philosopher Thomas Hobbes (1588-1679) took this a step further: if all the removed pieces were assembled into a complete ship, then which is Theseus' ship? Are they both Theseus' ship? He concludes that this would be absurd. Even the early scholars understood that there were problems with these concepts, and struggled to reconcile the issues. Still, they did their best to understand how reality worked, and how that would help them to understand everything else. ...such as whether we have individual souls. That discussion will take us back to Averroes tomorrow. 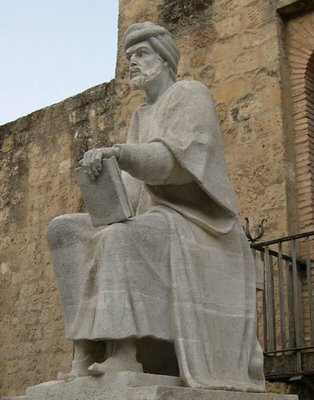 Averroes (1126-1198) was born in Córdoba into a family of distinguished jurists and scholars at a time when Islamic culture was flourishing in Spain. He probably would have spent his life as a judge if not for his mentor and friend, the physician Abu Bakr ibn Tufayl, who told him that he should write commentaries on the works of Aristotle. The problem seen by ibn Tufayl was that Aristotle was too obscure either because of the ambiguity of his own writing or the shortcomings of his translators. Averroes, whose real name was ʾAbū al-Walīd Muḥammad bin ʾAḥmad bin Rušd, embraced the task so thoroughly that, to the West, he became known as "The Commentator." His scholarship was embraced across cultures: Jacob Anatoli translated Averroes' Commentaries into Hebrew. Anatoli's colleague and friend Michael Scot translated some directly into Latin. He analyzed and promoted most of Aristotle (and Plato's Republic) to the known world, as well as writing dozens of books of his own. So far as we know, he did not have access to original texts—there is no evidence that he knew Greek—and so his commentaries are based on Arabic translations of Aristotle. Unfortunately for him, his rationalist views often got him into trouble when they came up against Islamic theology (which he had studied extensively). He was, in fact, banished by a caliph to whom he had been the personal physician, because some side remarks in Averroes' writing (such as "that Venus is one of the gods") struck the caliph as blasphemous. Fortunately, Averroes was allowed to return home prior to his death. One of his most radical ideas, based on Aristotle, was that there were multiple intellects, but only one shared soul for all of mankind. To explain that raises more questions, however, unless first we look at a debate I have been putting off for months. Tomorrow, therefore, we will (finally) discuss Nominalism vs. Realism. Daily Medieval has frequently mentioned the importance of Arabic texts in the transmission of knowledge to Western Europe. Arabic, however, was not a commonly known language, and Arabs did not have a strong presence in Western Europe. Arabic culture often brushed up against Latin culture in the southern Mediterranean, as mentioned Salerno, or when a scholar such as Michael Scot made it a point to learn Arabic. Scot probably had help in the form of Jacob Anatoli. Jacob ben Abba Mari ben Simson Anatoli (c.1194-1256) grew up in southern France, and gained such a reputation for scholarship that he was invited to Naples by Frederick II, who gathered several other academics to his court, such as Scot and Fibonacci. Anatoli became known for his translations of Arabic texts into Hebrew, and he very likely aided Michael Scot in his Arabic translations. Roger Bacon explains that Scot was aided by a Jew named Andreas, and some scholars believe "Andreas" to be a misunderstanding of "Anatoli." Of his non-translations, the greatest work is the Malmad ha-Talmidim (the title is a pun, being interpreted either "Teacher of the Students" or "Goad to the Students"). The Malmad shows a wide range of knowledge, incorporating the Old Testament and Jewish commentators, but also the New Testament, Aristotle, Plato, and Averroes. 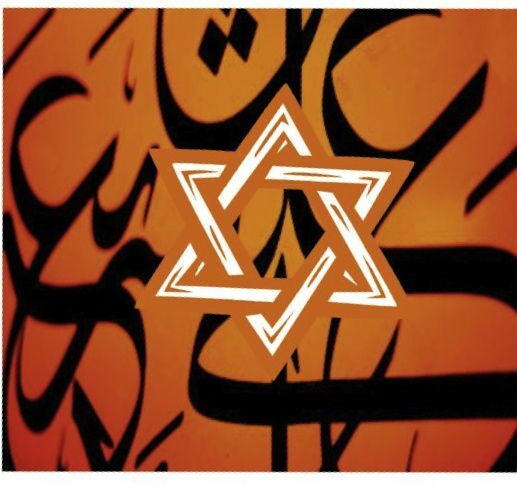 His egalitarian approach to Christian and Muslim matters was refreshing, but Judaism still had special status; he wrote "the Greeks had chosen wisdom as their pursuit; the Romans, power; and the Jews, religiousness." He tells us that a non-Jew who seeks religious Truth should be respected by Judaism and not mocked. Anatoli extended this intellectual courtesy to Frederick II, incorporating remarks by the emperor in his works. He also mentions a Christian whom Anatoli considers a second master (after Anatoli's own mentor, Samuel ibn Tibbon); this "master" has been equated to Michael Scot. As for his Arabic translations, Anatoli's crucial contribution was exposing the West to the work of Averroes, one of two Arab scholars (the other was the medical expert Avicenna) whose work is considered fundamental to the Middle Ages.We'll look at Averroes tomorrow. How long has the universe existed? Has it been around forever? Did it have a beginning? Could it have a beginning? These questions troubled the ancients. Aristotle in his Physics tried to answer this through reason. Everything that comes into being does so from something that already exists; matter is made from matter, after all. The matter of the universe would have to come into being from some underlying matter; it couldn't come from nothing. For the matter of the universe to come into being, some matter must have existed before it. This statement is ridiculously self-contradictory, and therefore could not be taken seriously. The universe must have always existed. Others supported Aristotle. Critolaus (c.200-c.118 BCE) couldn't believe that human beings would ever stop simply procreating into eternity. In the Early Medieval Period, Proclus (412-485) produced De Æternitate Mundi (On the Eternity of the World) with 18 proofs. This belief was about to collide headlong with Christianity, however. The Bible makes it clear that there was a moment of Creation. That being the case, the universe cannot have been eternal. John Philoponus (490-570) was a prolific and controversial writer who realized that Aristotle needed to be questioned on some things. Although he would be condemned after his death as heretical for interpreting the Trinity as three gods instead of one God, he was known in his lifetime for defending the Biblical necessity of a universe with a starting point. He wrote "Against Proclus" in which he challenged every one of Proclus' arguments. The basis for his argument is simple, and referred to now as the Traversal of the Infinite. If the existence of something relies on the existence of something else prior to it, then you need to account for the existence of the prior thing. That prior thing would rely on the existence of something before that, and so on. You have to have an infinite series of assumptions that something existed before the thing that came afterward, and never actually explain where any of the substances came from. The world could not possibly be infinite, and must have been created by a divine being. Prior to the Age of Exploration, human beings in the western hemisphere did not attempt to travel long distances by sea and discover distant lands. * This was partially because ships that could handle a very long voyage were not able to be built or provisioned easily for such a journey. ** Another reason is that the world was "known" to be shaped so that long voyages were fruitless. Eratosthenes (c.276-c.195 BCE) had established in the Classical Era the spherical nature of the Earth through simple and clear experimentation; no one disputed that. (His math on Earth's diameter was probably a little off: the unit of measurement he used probably gave him an Earth 4000 miles larger around than it is.) What was up for debate was the question of what existed "over the horizon." Aristotle (384-322 BCE), upon whose scholarly shoulders the Middle Ages tried to stand, loved symmetry. It made sense to him that there were five zones (from the Greek word meaning "girdle") around the Earth. The extreme top and bottom were icy cold and uninhabitable. Just inside of them were the temperate zones where humans and animals lived—note: he believed both temperate zones were inhabited. In the middle it was so hot—and clearly, the further south you go from Greece and the Mediterranean the hotter it got—that it was uninhabitable. Pliny (23-79) said that this central zone was so hot that it was actually a ring of fire and was unlivable and impassable, so we would never be able to visit the people living in the southern hemisphere. Wait, said Christianity. That can't be. The Flood covered the whole world, and when the waters receded, the Ark of Noah came to rest on Mt. Ararat in Turkey, from which all the animals strolled away and repopulated the world. 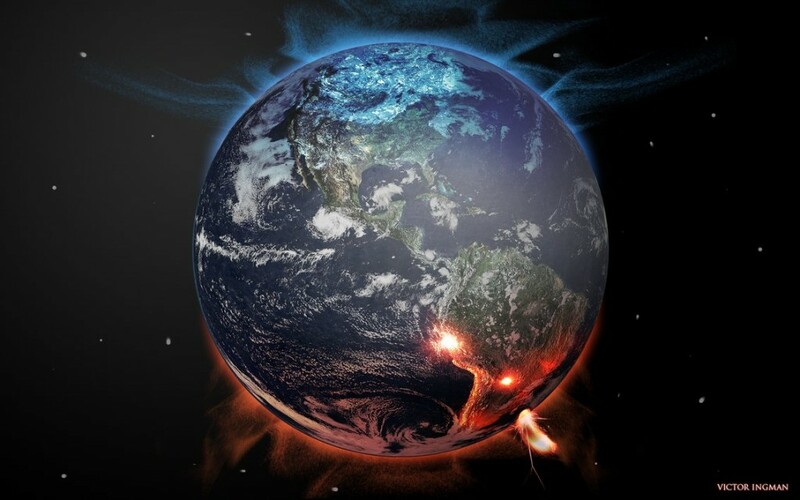 If the ring of fire at the equator is impassable, how can there be animals living beyond it? Worse, if there are people living in the southern temperate region, how are we going to reach them with the Word of God? Proving that classical scholars did not always agree, Ptolemy presented different problems in geography. His Geography was translated and made available to Western Europe in 1406. His map (depicted above in a 15th century version printed in Ulm) showed that all you had to do was sail far enough south to reach the southern lands in the world, but he also extended the bottom of Africa eastward, enclosing the Indian Ocean. This meant you could not sail to the Indian Ocean and therefore to India, but would forever have to use the Silk Road (and incidentally pay tolls at every border crossing, something sailors get to avoid). The Age of Exploration changed all this. In 1473, Aristotle was proved wrong with a Portuguese ship exploring the west coast of Africa passed south of the Equator. In 1488, another Portuguese ship sailed around the Cape of Good Hope and reached the Indian Ocean. India and the east were accessible by ship after all, and the Portuguese quickly established those shipping routes. Ptolemy's Geography was erroneous in another way. He estimated the Earth's circumference at thousands of miles smaller than Eratosthenes. Since no one cared to duplicate Eratosthenes' experiments and determine the distances involved, Ptolemy might have been taken as truth by some. His estimates of the size of a spherical Earth would put Asia thousands of miles closer to Europe by sailing west. With Portugal dominating southern routes to the East, was it Ptolemy's miscalculation that prompted Spain's Columbus to try a bold plan to establish a different and (he thought) shorter route? *Perhaps some day we'll get to some of the rare cases of accidental discovery of previously unanticipated lands. **I have been aboard replicas of Columbus' ships; they are frighteningly small considering the journey they made. The goal of Daily Medieval is to present a sampling of the infinite array of information about the Middle Ages in small, digestible amounts. It offers a taste of the thousand years of people, events, and ideas that don't get covered in the streamlined history books of standard academic courses. To that end, it tries to avoid those things that people "already know" and focus on the lesser-known lights that shone at the foundation of modern civilization. Sometimes, however, the obscure overlaps the well-known, and I find myself "forced" to write about something or someone that I worry is known well enough that the daily entry won't give the reader anything "new." My goal then becomes to broaden the reader's knowledge in unexpected ways. Which brings us to William of Ockham. I would be surprised if readers of Daily Medieval had not heard of Occam's (or Ockham's) Razor, a guiding principle that says one should not make more assumptions than absolutely necessary to try to explain something. 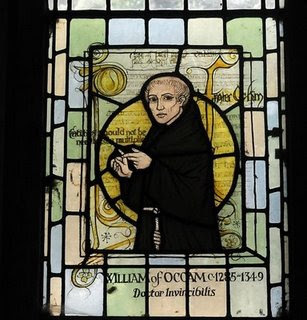 William of Ockham (c.1285-1349) was responsible for so much more, however. Believed to have been born in Ockham in Surrey, England, he wrote about metaphysics, logic, theology, politics, and more. 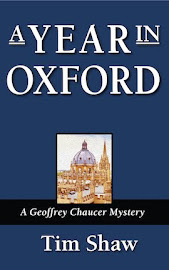 All this writing, however, happened when he left Oxford University in 1320 without a degree in theology. The prevailing theory for this unexpected departure is that he would not acquiesce to changing his commentary on the Sentences of Peter Lombard, a common part of the final examination for university students. The basis for the theory is how the situation blew up years later. Ockham was summoned to Avignon to appear before Pope John XXII and a committee that would examine his writings. The committee, chaired by John Luttrell (an ex-chancellor of Oxford) found 51 heresies among William's commentary on the Sentences. It is believed that William escaped punishment by appealing to the Holy Roman Emperor (at the time, Louis IV), who was not always on good terms with the pope, saying to him "You defend me with the sword and I will defend you with the pen." In effect, he placed at the disposal of the Emperor his intellectual gifts, which (if this story is true) must have been known to be considerable for this ploy to work. How did William earn his intellectual reputation? Between leaving Oxford in 1320 and arriving in Avignon in 1324, he spent three years in a Franciscan monastery, writing prolifically. One of the topics he put his mind to was whether priests should be allowed to own property. Franciscans believed priests should live a life of poverty. This put them into conflict with Pope John XXII, so the summons to Avignon and condemnation may have had more to do with that question than his Oxford writings. Besides challenging the Church's ideas about material wealth, he was also challenging the ideas of people like Thomas Aquinas that reason was sufficient to determine everything we needed to know about the world. In the introduction to Arian Christianity I mentioned how discussion at the Council of Nicaea in 325 became so heated that Bishop Nicholas of Myra slapped Arius' face. Much of what we think we know about Nicholas is difficult to substantiate, but this has not stopped historians from talking about him. In fact, it is the least-documented information we have that has developed his reputation the most. Nicholas (c.270-6 December 343) was born at Patara, in Asia Minor. As a young man he made a pilgrimage to Egypt and Palestine; upon his return he was made Bishop of Myra, not far from his city of birth. During the reign of the Emperor Diocletian, Nicholas was imprisoned, but freed once the Christian Emperor Constantine came to power. He attended the first ecumenical council of the new Catholic Church in 325, which was called by Constantine in order to determine the (in)validity of Arianism (see the link above). Nicholas is counted among the numerous men who assembled there, and (as mentioned) became passionate about the debate. Well, that's the story anyway. There are some lists of participants on which his name is not found, casting doubt on his presence at Nicaea. But his importance to legend is unquestioned. His popularity as a saint in Greece and Russia began early. Emperor Justinian I (483-565) built a church to Nicholas at Constantinople. 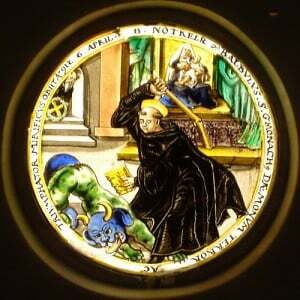 He was revered in Germany during the reign of Emperor Otto II (955-983). His feast day is today, December 6. In some countries, children put their shoes outside their doors on the evening of the 5th, and on the morning of the 6th find chocolate, coins, or trinkets. In the Middle Ages, The Bible was recognized as the most important book in existence. No book was more discussed and commented upon. Many of the commentaries themselves, such as those of the Early Church Fathers, became only slightly less significant objects of study. The Early Church Fathers did not always agree, however, which led to confusion, and (if you weren't careful in your reading and expounding on what they said) to heresy. Into this dilemma stepped Peter Lombard. Peter Lombard (c.1095-1160) was born in Italy. He studied at Reims and Paris, and taught for ten years in the cathedral school at Notre Dame where he would have met some of the greatest theologians of the time. He was ordained by 1156, and was made bishop of Paris in 1159. At some point he found time to write. Although he wrote commentaries of his own, his great work was the Libri Quatuor Sententiarum (Four Books of Sentences), in which he attempted to cover the entirety of biblical scholarship and knowledge by laying out passages from the Bible with relevant commentary from the Early Church Fathers and others. He tries to show where there is agreement among the commentators; where there is disagreement, he tries to reconcile the opposing viewpoints. The four books covered the Trinity, Creation (and the world), Christ and salvation, and the Sacraments. The Sentences became the standard theology textbook for the next 400 years, and formed the basis for understanding the Bible and Christianity. Because of the fundamental position the Sentences takes in theology, it was at the center of most theological study. Therefore, students were given a simple task: write your own commentary on the Sentences of Peter Lombard. Your masters would read your commentary to see if you understood the Bible and its learned analyses properly. If you did not, you were told to correct your commentary. If you corrected your commentary, all was well and good. If you decided that you were right and that you should argue with your masters, you ran the risk of (at the very least) not having your degree conferred, or (at worst) being declared heretical. ...and that's what one of the most famous medieval thinkers—the one whose name everyone today knows—did, and it got him expelled from Oxford University.